This parabola-shaped flying wing was developed by German designers Reimar and Walter Horten during the Third Reich. U.S. authorities after the war proved very interested in discovering the technology behind it. 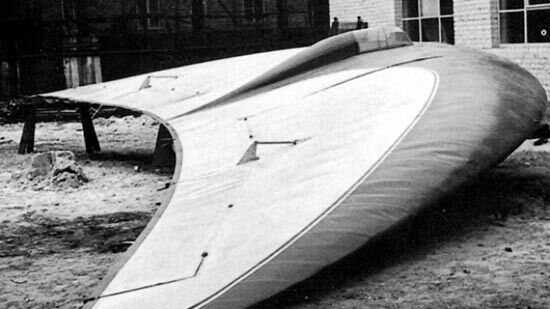 When people learn of my interest in the history of UFOs and aliens, I am often asked, “Why flying saucers?” What they generally mean by this is, why did the image of extraterrestrial spacecraft take the shape of “flying saucers?” Why not something else? The question of “why” is always a tricky one for us historians. Answering it always depends on what kind of explanation you’re looking for. So it actually can be a pretty imprecise way of posing a question. That is why most historians tend to prefer to pose questions in terms of “how” rather than “why.” So, then, how exactly did the image of “flying saucers” come about? Of course, those who have believed that flying saucers do in fact exist in reality have a ready-made explanation – that’s how they were designed by their makers, they would say. Now, some witnesses and believers have contended that aliens civilizations are behind these vehicles, but many others have been of the view that the flying objects are terrestrial in origin, the creation of secret government programs. In either event, both groups believe one must look to aeronautics to explain the design. If, however, we adopt what could be called an ethnographic approach to the question – this would insist that the researcher adopts a sympathetic, but critical, distance between herself and those she studies – then it’s possible to break the original question down into several. First, have witnesses in fact reported only or primarily seeing “flying saucers?” It turns out that that assumption is false. As discussed in the previous blog entry on the Ghost Rocket Scare of 1946, most people in Sweden at the time actually reported seeing rockets and missiles. And during the early years of sightings in the late forties, some also described seeing cigar-shaped objects, while others claimed to have seen lit or colored balls. 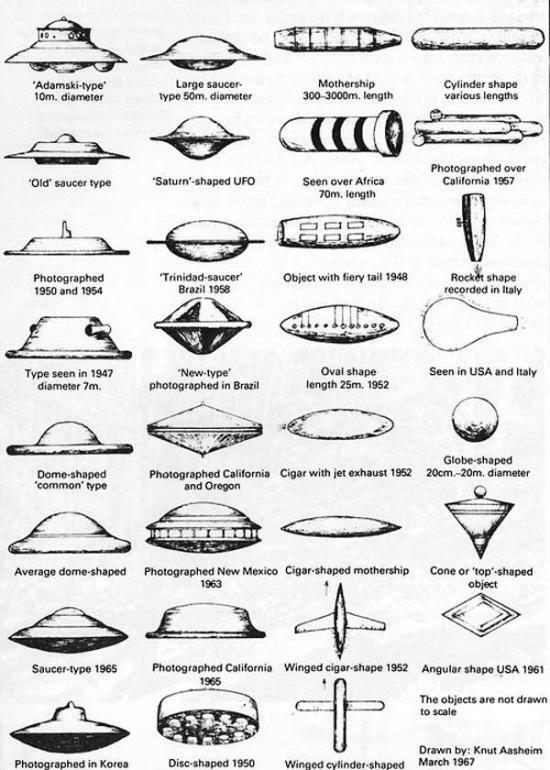 The UFO typology chart below, developed in 1967, shows some of the range of what witnesses reported seeing by then. So, while “flying saucers” have historically predominated among witness reports, other kinds of flying objects have also been reported. The next questions then are, when and how did the term “flying saucer” start being used? As I have explained in a recent article (and based on the research of journalist and folklorist David Clarke), in June 1947, a private pilot by the name of Kenneth Arnold was flying over Washington state in the U.S. when, as he recounted, he saw what looked like nine odd-shaped aircraft flying in formation at around 10,000 feet. Arnold described them as “flat like a pie pan and somewhat bat-shaped” (artistic renditions he later endorsed look very similar to the Horten brothers’ aircraft). Interviewed by the press soon afterward, he explained that the objects “flew like a saucer would if you skipped it across water.” Though never uttering the phrase “flying saucers,” newspapers throughout the world rapidly adopted the term, and a Gallup poll published a few weeks after Arnold’s encounter revealed that nine out of ten Americans were already familiar with the term. 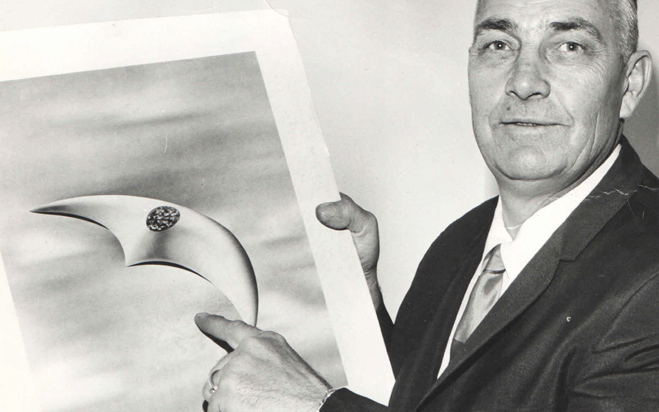 Within months, then, the expressions “flying saucer” and “flying disk” had become not only ubiquitous, but synonymous with sightings of unusual aircraft. • and thus, they rearrange and transform the ways in which objects or experiences are understood in relation to individuals. “Flying saucer” therefore was not just simply a convenient term without any wider social significance. It also carried with it a number of other associations – for example, UFOs = an uncanny experience, must be the product of advanced technology, raise the possibility of alien visitation. And so it’s not just that a term was circulating in the press and in personal conversations, but that a set of emotions, ideas, and stories were also being encouraged along the way. I think the word you were looking for is “baggage”. The terms “flying saucer” and “UFO” have what is often termed “cultural baggage”. Being a literalist, the thing I have always despised about the term UFO is that everyone *assumes* it to be associated with the cultural baggage rather than it’s actual definition–literally–of being an UN-IDENTIFIED OBJECT that at least appears to be FLYING. The term “UFO”, you see, does not necessarily equate in a ubiquitous way with the concept of “alien craft”. And this is where the semantics of intelligent discussion and scientific discourse get broken down and subject to a constant re-clarification of terminology–not at all unlike the very paragraph you are reading. In modern parlance, we call such discussion “meta”. Yes, one might well term it “baggage.” Of course, the term “UFO” was created in the 1950s to supposedly clarify matters – and especially to get air force personnel to not use the term “flying saucer” in official documentation – but it only added to the confusion in the end. Thus, some ufologists prefer the term “unidentified aerial phenomenon” as a way to avoid implying that whatever was witnessed necessarily was a craft of some kind.